Johanna Hildebrandt began painting in 1980 and has had several successful solo shows. Johanna Hildebrandt arrived in Australia 20 years ago from Bavaria. She began painting in Sydney in 1980 and has had several successful solo shows at Naïve Galleries in Melbourne and Sydney. Her work was also included in a major naïve exhibition from Australia shown at Musee d’Art Naif in Paris, and Queensland House in London. True naïve paintings like Hildebrandt’s are an idealised portrayal of an orderly world, often having a fairytale atmosphere. The work is totally individualistic without reference to artistic conventions. These artists paint this way because that is the only way they know. 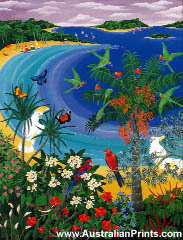 Hildebrandt says “a constant source of inspiration is my love for the Australian flora and fauna. 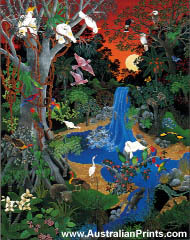 The unique wildlife is a continuing influence on my vividly coloured interpretations of all nature”. Artist information page for Johanna Hildebrandt.